Use |x| to enter expressions that involve an absolute value such as | -2 |, | -2 + 4(-3) | and | -2x +3 | = 5. Tap the absolute value key and then enter the argument. If the argument includes multiple terms, enclose them in parentheses. Note: This function also computes the distance from 0 for complex numbers. Enter each expression as given with one expression per line. Use the absolute value key |x| before entering an argument. Norm refers to the magnitude or length of a vector on a vector space. 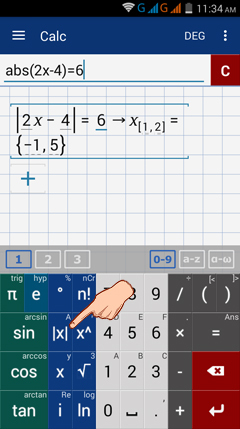 To use the norm command, tap the absolute value key |x| twice. Enclose the arguments in brackets and use the space bar to separate terms.